Dallas seems to be waking up to its own pre-history. Archaeology is an exciting topic. There’s the digging, the unearthing of evidence, and the exercise of imagination in reconstructing life on Earth hundreds and thousands of years ago, often based on fragmentary information. Currently there’s a sort of synchronicity occurring around the topic among the Dallas’ academic, cultural, and scientific institutions. Earlier this month, the Perot Museum of Nature and Science reopened the Being Human Hall. It had been one of the original halls that debuted when the museum opened in late 2012. In an effort to keep content “fresh and relevant,” the hall has undergone a complete transformation, said spokesperson Becky Mayad. “The content developed in the exhibit tells a broad human origins story from millions of years ago through present day.” When asked if the Being Human Hall might have room for local archaeology, Mayad responded: “While the focus is on paleoanthropology, we do see the Human Journey more broadly and may address more archaeological and anthropological topics as our programming develops.” For now, museum-goers can view casts of fossil skulls, hands, and feet of some of the earliest human ancestors. 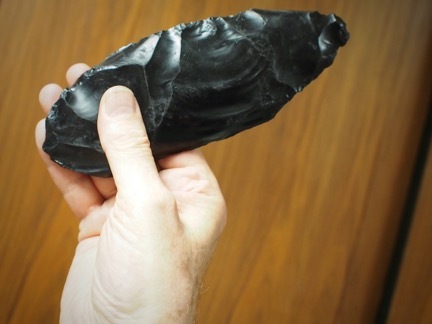 In addition, there are a dozen authentic stone tool artifacts on display, some more than 1 million years old. The show at the Nasher and the Perot’s reinvented Being Human Hall represent projects international in scope at top-tier, donor-supported museums. But no less impressive are the efforts underway at SMU to save local archaeology. There’s a flurry of activity surrounding SMU’s Archaeology Research Collections (ARC), though developments haven’t yet hit the press release stage. What follows is a preview of things to come. Since the publication of my story on local archaeology in the December issue of D Magazine, “Where Dallas’ Oldest History Goes to Die,” momentum has been building and projects launched due in large part to the efforts of Dr. Sunday Eiselt and her highly motivated students. 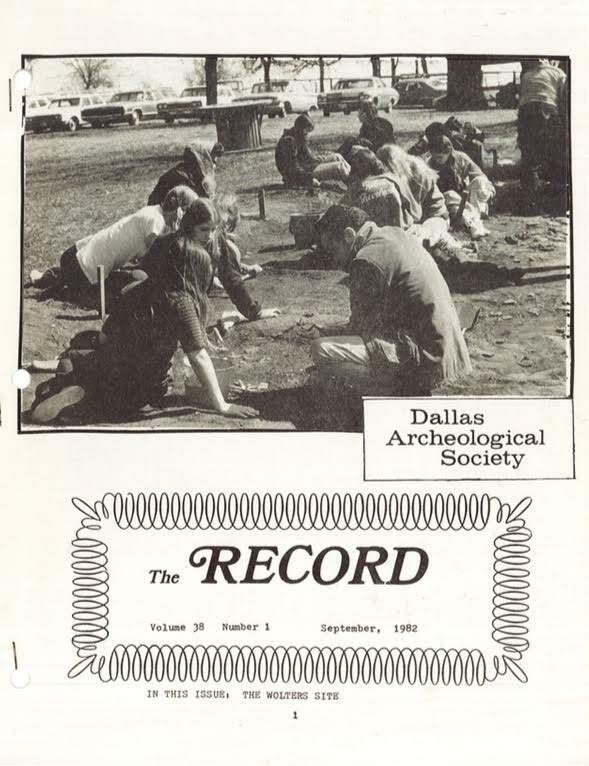 The energy and esprit de corps of SMU’s archaeology department has always been strong. The story, in some ways, is a bridging document that has reignited passions and prompted people to reconnect. One person who has reconnected is Christy Bednar. She was married to Fred Wendorf at the time of his death and worked on excavations with him in Egypt. Since the beginning of the year, she’s been logging hours on campus in the archaeology lab. Eiselt said the benefits of having Bednar there are numerous. “In addition to being an incredible role model, she provides the authenticity and sincerity to our work that I cannot replicate for my students because she actually experienced this history, loved Fred, and she brings all of this to our work,” Eiselt says. Title page of The Record from 1982. In the near future complete issues will be available online through SMU. Other developments were showcased at two on-campus events on May 7. 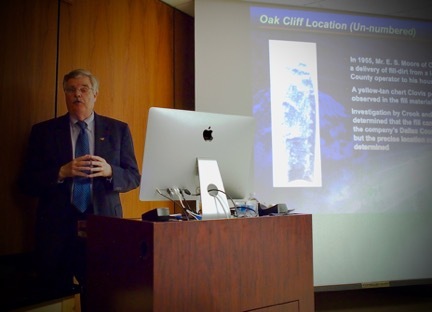 The first event was a talk by Wilson “Dub” Crook on Clovis culture along the Elm Fork of the Trinity River, with an emphasis on Dallas County. The room in Heroy Hall was packed with students, archaeologists, and members of the general public eager to hear him discuss “The Role of the Upper Trinity Watershed in the Peopling of the Americas.” (Crook’s name may sound familiar; he is the person mentioned in the December article who grew up excavating sites with his father and R. King Harris.) At the second event of the day, an invitation-only gathering of alumni and friends of SMU archaeology, Crook made a surprise donation to ARC of $5,000. The second event of the day took place in the atrium of Dallas Hall. Eiselt’s students—Rachel Burger, Bonnie Etter, Barrett Stout, Lauren King, Jordan Hardin, and Ryan Karakani—had set up discreet exhibitions that included artifacts, photos, text, and handouts. One exhibit set off in a nearby conference room demonstrated 3D scanning and first steps in creating online exhibitions of SMU-held artifacts. The students were also present to knowledgeably discuss each exhibit with attendees. Eiselt said the exhibits are “what we are calling our Legacy Projects, collections from significant sites that are associated with important events, people, or places that were excavated at or around the time of the founding of our department in the 1960s.” The students, she said, chose their favorite collection from ARC storage and spent the semester on research as well as the development of displays capable of telling a more complete story for each. The students succeeded; though exhibits were displayed in trays rather than vitrines, each was museum-quality. 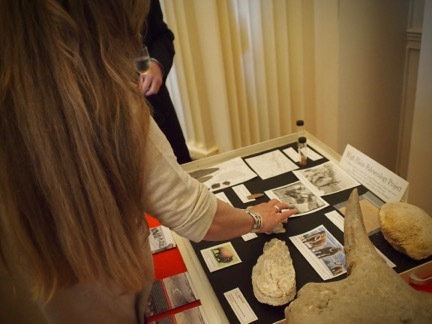 The group of about 70 attendees spent time viewing each one, and in some cases, handling actual artifacts. Near the conclusion of the event, Eiselt made an announcement. ARC, under her management, is headed to new heights: she publicly announced her intent for becoming a state-approved facility in the next one to five years, meaning SMU could accept local archaeology. It also means that to meet the standards for becoming such a facility, ARC needs to make substantial upgrades to its storage areas. Under her leadership, there have been great strides in stabilizing derelict shelving and collapsing boxes as well as creating usable indexes. And her students have proven they have the right stuff for organizing and preparing exhibits ready for off-campus display in partnership with other facilities. Eiselt has the vision, human resources, and momentum to achieve her goal, but ARC needs financial help. If SMU given the nod by the Texas Historical Commission as an approved facility, she says, all types of grants and funding would be available that are currently off-limits. While it may not be fully visible yet, she is ready to take on stewardship of Dallas’ oldest history.